In this new post I want to share a mix of things that I feel are fun and worth sharing. I recently found another interesting book that I would like to share with anyone interested in Mixed Media and fabric. There are numerous lovely books out there, but unfortunately I find many of them are just filled with photos of very interesting works of art, but with limited information. I truly hate to be critical but with the cost of some of these books, I want ideas along with great techniques. The newest book that I found that I feel fits this criteria is called "Fabric Embellishing - The basics & beyond". It has over 50 techniques shown with easy to follow instructions. It might be worth checking out if you love "mixed media". The next thing to share is something I found today while picking up thread for a sewing project. 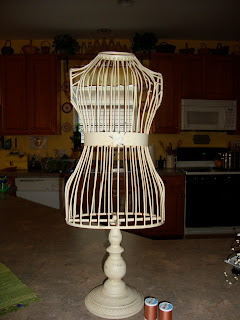 I happened to come across this really neat wire dress form on the clearance shelves. With 75% off the original price, it was a "MUST BUY"! So I'm seeing some fun ways to decorate or alter this find. Once the work begins I will be happy to share photos. Something else to share is called "Inspired at Home". There is a website to check out. On Sunday evenings there is a radio show that is "live". If you are interested in anything creative you may want to listen in. The shows can be downloaded from iTunes under podcasts. Another fun thing to check out too is something they do on Wednesday evenings called "Wednesday Night Pajama Party". It's hosted by Maria Nerius. If you have never heard of Maria, she is a truly creative woman that has been involved within the creative industry in so many varied ways. You will find information about all of these things on the "Inspired at Home" website. Check it out - get inspired!